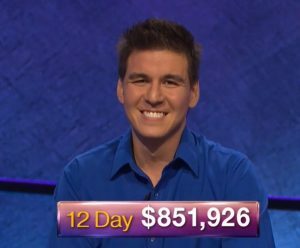 Andy Saunders of thejeopardyfan.com discusses last week’s Jeopardy! episodes with recent contestants Rosie Jonker and Rachel Lindgren. Today’s Final Jeopardy answer (in the category Children’s Lit) and game statistics for the Friday, January 26, 2018 game between Melissa Stewart, Jennifer Tomassi, and 5-day champion Rachel Lindgren. Today’s Final Jeopardy answer (in the category 19th Century Europeans) and game statistics for the Thursday, January 25, 2018 game between Jeff Machusko, Rosie Jonker, and 4-day champion Rachel Lindgren. Today’s Final Jeopardy answer (in the category Business & Industry) and game statistics for the Wednesday, January 24, 2018 game between Rachel Lindgren, Del Scott, and 1-day champion Eric Raygor. Today’s Final Jeopardy answer (in the category Literary Brothers) and game statistics for the Tuesday, January 23, 2018 game between Katie Champagne, Alex Schindele, and 1-day champion Rachel Lindgren.